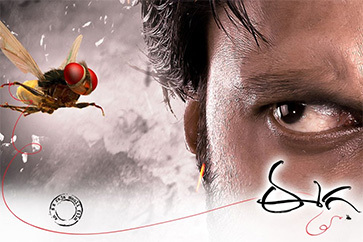 Eega - "Gripping tale of a Warrior Housefly"
The concept of Super Heroes is not new to Telugu Cinema. Right from Black and White era till recent times, the presence of Super Hero was seen as a person who is well-built, exceptionally equipped with powers, and in short- somebody who can be like a role model for kids. A Super Hero is imagined as savior, who reduces the differences between rich and poor, and solve the problems of people in a flash! Ranging from the Hollywood’s Spider-Man or the indigenous Doordarshan’s Shakthimaan, this feature has been untarnished. By late 2010, S.S.Rajamouli not only made his mark as an ace director with Magadheera (2009) but also as a director who is capable of taking a gripping tale of Comedy with Sunil in the lead-Maryada Ramanna. 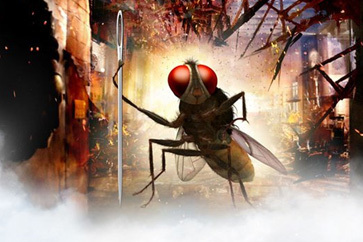 While the entire Telugu Film Industry along with the film audience held their breath to see what Rajamouli is going to do next, he announced a groundbreaking project “Eega” – the story of a warrior fly! It raised so much curiosity among the audience as well as film people, and even made them shocked with disbelief. Owing to the rock steady position of S.S.Rajamouli by then, making a film with a fly as the Super Hero was something unheard of. If backfired, it would have been a terrible loss for his career graph. But when the film is viewed, people started empathizing with the lead role (Eega) and even clapped, jumped , sighed and exclaimed at the breathtaking moments it offered. It is essential to know more about the story and the people behind this modern Epic to appreciate the versatility of the film. The film begins with a child pestering her father to tell a bedtime story. Rajamouli’s brilliance is shown where the characters are not shown on the screen but just the voices are heard. When the father gets tired of his kid’s tantrums demanding an altogether new Super Hero’s story, he begins narrating the story of the warrior fly Eega. Nani (Nani) is a happy-go-lucky young firework manufacturer who sincerely loves his neighbour Bindu (Samantha) a micro artist by profession. She also runs an NGO named Project 511, to help the poor children for education. Though Bindu acts as if she doesn’t observe Nani’s intentions, she finds him in quite wonderful herself. Nani’s character is so positive and uplifting that, despite Bindu’s silence, he optimistically hopes she will love him some day. The story goes quite entertaining and light hearted until Sudeep (Sudeep) an evil businessman falls for Bindu when she comes to meet him for donation. His nature is shown quite obvious for the viewers that, if he wants to get hold of something, he would go to any means to succeed. Very soon, Sudeep comes to know that Nani loves Bindu. After a wonderful song between Nani and Bindu, and at the right time when Bindu decides to confess her love to Nani, Sudeep kills our dear Hero in the most brutal manner. 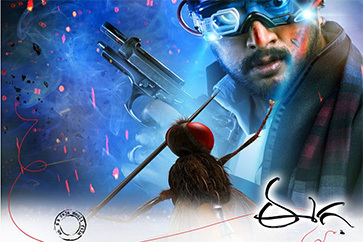 But Nani’s love is so eternal that he is reborn as Eega (Housefly) and the real entertainment begins when Eega starts showing hell to Sudeep and even attempts to take revenge. Sudeep is too arrogant to believe that a Housefly could create so much trouble initially, but soon realizes that it is the truth. The rest of the story is about the entertaining sequences between the three lead characters- Eega, Sudeep and Bindu. The most noted people behind the screen would be no doubt- S.S.Rajamouli for his meticulous direction. He even dubbed for the Eega, where unlike the English animation films- the Fly does not speak at all. 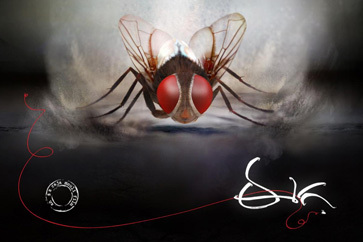 It is just the sounds through which Eega communicates throughout the film. The visual effects team- Makuta Effects has to be highly commended for their meticulous visual sense in capturing Eega to life. The actual housefly would look quite terrifying to watch on the big screen but our Super Hero Eega is made not only glamorous but also a pleasure to watch on screen. M.M.Keeravani, the regular music director for all Rajamouli films gives another fantastic work, which aptly suits the mood of the film. Though Nani’s screentime is quite less compared to the general standards for a lead role, he delivers the right performance needed for the film. His tremendous comedy timing was well utilized by Rajamouli. Samantha is classy as usual and gave a memorable performance as the estranged lover of Nani. Her costumes (Designed by Rama Rajamouli) look apt for a micro artist and Samantha handles every scene with ease. But it is undoubtedly the talented actor from Karnataka – Sudeep who steals the show in every frame of the film. It is not an easy task to act as if a Housefly is troubling, when there is no such thing during the filming process! The film has earned National Award for best film and best visual effects for the year 2012 and has been screened in many International film festivals, including the prestigious Cannes Festival for this year. It has also been dubbed into Tamil as Naan Ee and in Hindi as Makkhi. 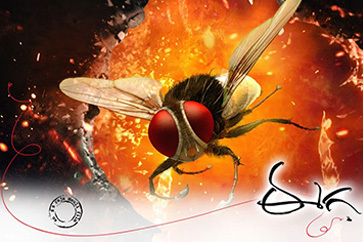 Eega is sure a Modern Epic not just for the technical aspects. It is an Epic because of the simple story of determination told in grandeur, where even a smallest creature topped with determination can achieve what it wants to do!